Thousands of mourners queued for blocks to view Aretha in repose in a gold-plated casket inside the Charles H. Wright Museum of African American History in Detroit. 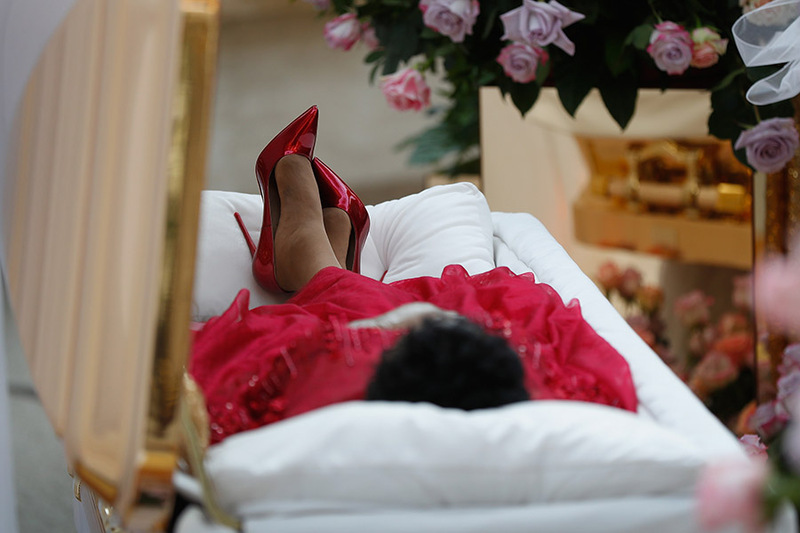 Aretha Franklin, who passed away on Thursday, August 16, in Detroit will be buried on Friday, but for now her body will be on view for four days leading up to the funeral. Thousands of mourners queued for blocks to view her body which was encased in a gold-plated casket inside the Charles H. Wright Museum of African American History. At one point in the morning, the line of visitors waiting to enter the first of two 12-hour viewing periods on Tuesday and Wednesday stretched for five blocks. Ms. Franklin was only the third person to lay in state at the Wright Museum, the other two being the civil rights pioneer Rosa Parks and Detroit’s first African-American mayor, Coleman Young Jr., said George Hamilton, the museum’s interim executive director. On Friday there will be an invitation-only funeral at Detroit’s Greater Grace Temple for Ms. Franklin, who died Aug. at age 76. It will be a star-studded event featuring Stevie Wonder, Faith Hill, Jennifer Hudson, former President Bill Clinton and many others.